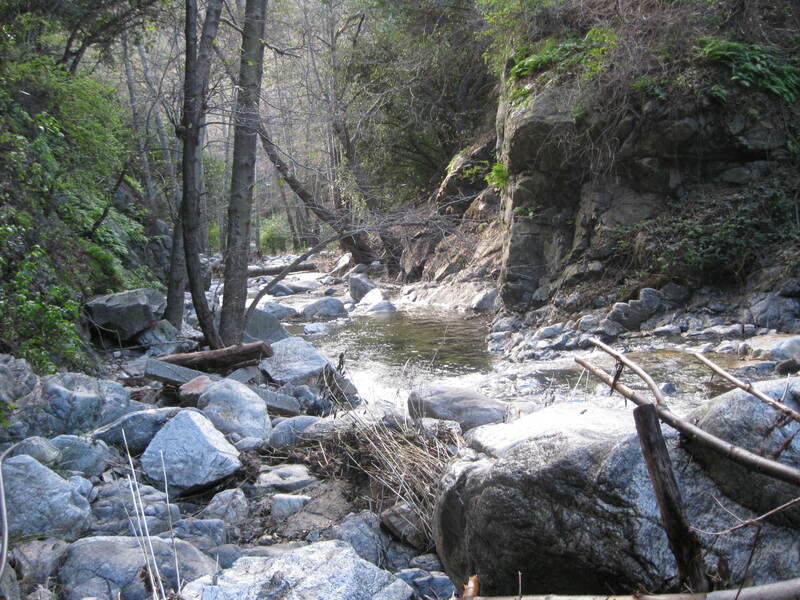 Oh, to be footloose, with fly rod in hand, in the San Gabriel Mountains. No tedious drive to the Owens River; no heart-thumping commute to the Kern. Yesterday, the January temperature was in the middle-50s, so my son, Will, and I decided to avenge our recent skunk on the L.A. River by visiting a cousin, literally 10 minutes from my wife’s office in Arcadia. It was a wonderful home coming. Whereas, stalking the elusive golden bonefish is still something I’m fine tuning, I’ve fished the San Gabes for years. And, basically you’ve got your teeny-weeny trout — mostly — then once in a while the fish gods throw in something to make it really exciting. Will and I brought a Sage SP 3 weight and a Winston Ibis 4 weight, both really nice stream rods, well-suited to the area’s steep canyon walls and narrow, faster-running waters. We’d strung up 6x tippets, and kept it simple with hi-viz Parachute Adams 18s. 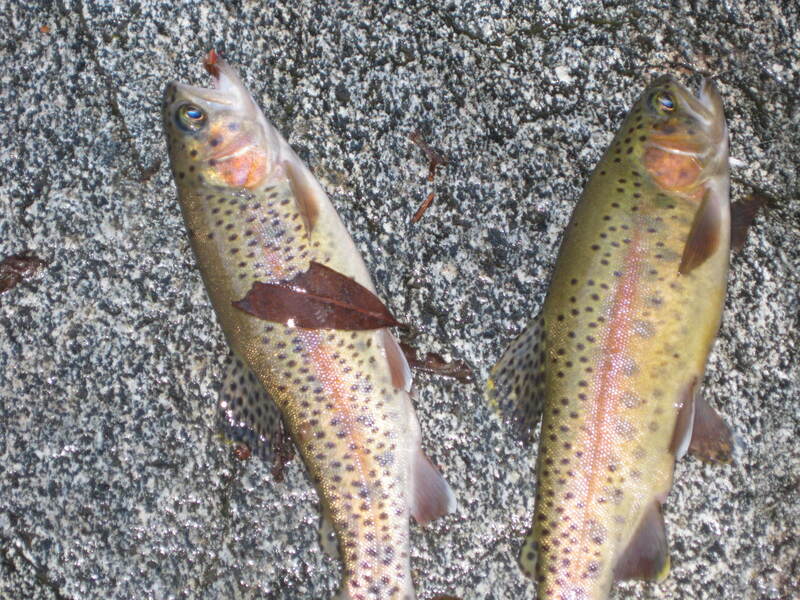 Two sweet rainbows took the same pattern fly at the same time. “Gotten any strikes?” I asked Will, while munching on a Fresh & Easy Italian sandwich. He looked at me as if four casts didn’t warrant a gentle prod from the old man. Yet, on his fifth cast, there appeared the strike that I so often get from this hole. He pulled up a small rainbow, and that set the afternoon’s tone, even as it clouded over, got windy-nasty and the near-freezing water chilled my fingers beyond my So. Cal. comfort zone. I could have gone on like that for a long while, reading the stream, then having smaller fish take the fly, over and over again. But, like I said, the fish gods can be unpredictable. And so, as we both cast into the biggest hole, I hooked up, watching the rod tip bend with a gift larger than most in this shimmering water. “Hey!” I called out to Will above the noise of cascading water, just in time to see his Winston’s tiptop bend as if it were staring into the misty pool to see what had come onto the line. Father-son hook up; same time; two ‘bows of the “keep ‘n’ eat” variety. We looked at each other with astonished eyes, with satisfied grins, with ripples of 20 years of past trips moving between us. Fly-fishing can move beyond the simple joys of the sport and play easily in the profound. It can keep fathers and sons together through rocky teen years and beyond. Our new friends got their photo-op, then we returned them to frigid waters. 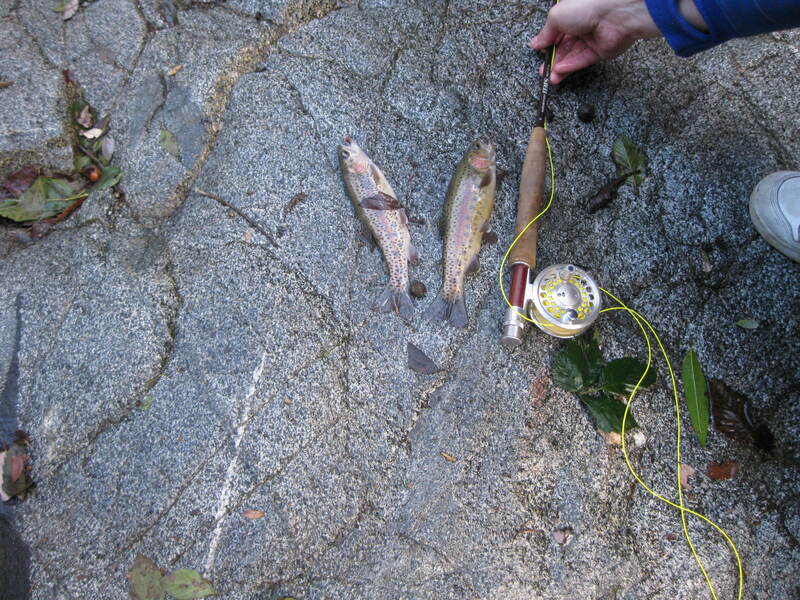 Check out the colors on these trout, which we quickly returned to the stream. Will wanted to stay for one more fish, and, sure enough, he hooked up again within a few minutes. As he pulled this one out, suddenly cries issued from above. I looked up by the waterfall to see four young people waving, taking pictures, shouting, as Will smiled. I thought the crowd overly enthusiastic for a stranger’s accomplishment. Would you believe me if I told you that after we hiked to the trail’s top, away from the water, I picked a lady bug from Will’s arm? Great story until you had to kill the fish. Guess your crowd doesn’t do C & R. Can you imagine what the fishery would be like if everyone took a couple home for dinner? Wildman, if you finished the story, you would know that both of those fellas swam happily back to their spots underneath the waterfall. I only catch/release. Thanks for the comment, though. It was a great way to spend some quality time with my son.